I'm not sure how I didn't stumble into The Fainting Goat sooner and I'm so excited that it is only a block from my place. I couldn't stop thinking about Adam Sandler's goat skit... This new neighborhood restaurant has a spring menu with seasonal flavors that will blow you away. Executive Chef James Barton impressed us with his fresh menu of dishes that popped. A staple starter of the Fainting Goat’s menu, the Garden, is the epitome of spring’s seasonal harvest: a collection of simply prepared, hyper-seasonal vegetables and herbs. Its menu description is intentionally kept vague, as Chef Barton adds in the most seasonal veggies he receives each morning from his local farm purveyors. I also loved the ricotta toast topped with walnuts and honey. Delicious! It reminds me of the toast at Casa Nonna with the ricotta honey spread that I've still been craving since it closed. You've got to taste the clams in the XO sauce. One of my favorite dishes was the house-made Goat Sausage with peppers and eggplant atop a buttered roll. The "Feed" section of the menu also has some succulent offerings of chicken and pork. Both dishes were very well done with juicy meats and beautiful plating. This is a restaurant where you don't want to skip the cocktail menu. Try their My-O-Tonic, where charred orange garnishes a simple concoction of Jensen’s Bernmondsey gin and house-made orange peel tonic water. The U Zoo St. Iced Tea mixes refreshing hibiscus tea with yuzu sour, Boyd & Blair vodka and Purasangre Blanco tequila. The Fainting Goat also offers a weekly-rotating seasonal punch during happy hour, which has ranged from a mango, lavender and white whiskey punch, to a strawberry, rhubarb, lemon and bourbon punch. The mixologist was sweet enough to make me mock-tail versions and they are the best I've had in the city. The Fainting Goat’s new spring food and drink menus are available starting now and can be found at www.faintinggoatdc.com. I loved the restaurant and I'll definitely be back soon! The Fainting Goat is a neighborhood restaurant and bar located on Washington, DC’s hip U Street Corridor at 1330 U Street, NW. The chic, welcoming restaurant serves a seasonal menu from Executive Chef James along with an extensive selection of bottled and draft microbrews, wines, craft cocktails and punches. 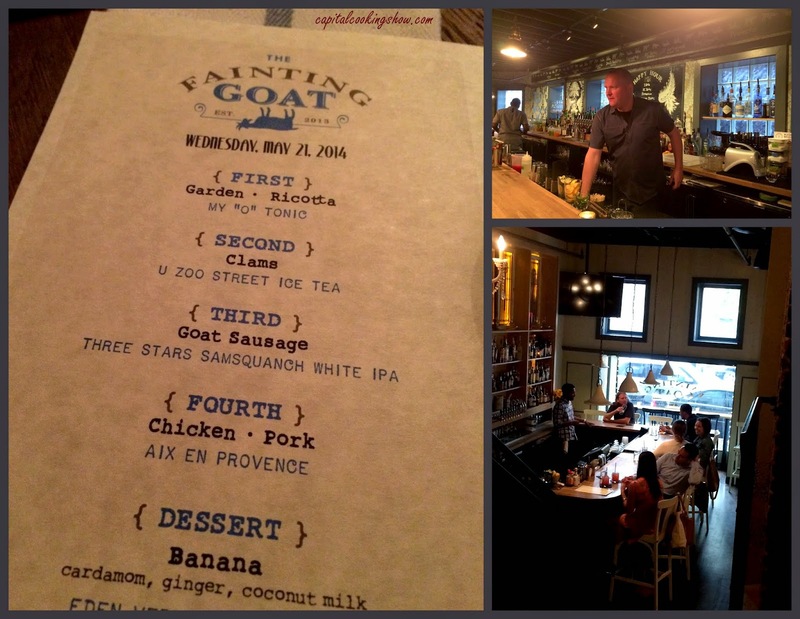 For more information, please call (202) 735-0344, visit them online at www.faintinggoatdc.com, or connect with them on Twitter (@FaintingGoatDC), Facebook (www.facebook.com/faintinggoatdc) or Instagram (@FaintingGoatDC).